For Kitty Doe, it seems like an easy choice. She can either spend her life as a III in misery, looked down upon by the higher ranks and forced to leave the people she loves, or she can become a VII and join the most powerful family in the country. If she says yes, Kitty will be Masked, surgically transformed into Lila Hart, the Prime Minister's niece, who died under mysterious circumstances. As a member of the Hart family, she will be famous. She will be adored. And for the first time, she will matter. and one Kitty believes in. Faced with threats, conspiracies and a life that's not her own, she must decide which path to choose, and learn how to become more than a pawn in a twisted game she's only beginning to understand. Kitty Doe lives in a world where the population are sorted by the roman numeral etched on their neck at seventeen years old, after a basic test of intelligence. Kitty has just turned seventeen and obtaining a below average III, she now lives with the consequences of having failed the once chance she had to show society that she was more than just an Extra. Kitty and boyfriend Benjy live in a group home for children who society calls Extras, orphans or those born into families who already have a child. Her low testing score now means that Kitty has been assigned a position in Sewage maintenance, travelling to Denver for work halfway across the country. Benjy refuses to let Kitty go, still only sixteen, running away would ensure that not only would Benjy miss his testing, but being unmarked is the lowest rank within the oppressive society. But when Kitty rebelliously steals from the community marketplace, before the Shields can detain her, Kitty and Benjy flee. The Shields are the authority that maintains law and order under the reign of the Hart empire and Ministers of the Union. Prime Minster Daxton Heart rules with an iron fist, but promised American citizens that the system is in place to ensure that those who give back to society will be rewarded, something that Kitty had believed in... Until her own testing. When the Shields arrive at the group home looking for Kitty, house maiden Nina refuses to turn her over, an offense punishable by being sent Elsewhere. The only way that Kitty can remain in the city, staying within reach of Benjy, is to seek solace at the illegal brothel. Where she is found by President Hart himself. Daxton offers Kitty the opportunity of a lifetime, the chance to become a VII, a rank only the presidential family obtain. She has no choice but to accept, or face being sent Elsewhere, which is a guaranteed death sentence. Whatever the catch is, is it was worth thirty thousand gold pieces and a VII ranking? The last thing Kitty remembers, is the world turning black, before waking up in restraints. It seems Daxton's niece, Lila Hart had died during a skiing trip recently, without the media's knowledge and Daxton has been searching for someone to fill her shoes. But when Kitty catches a glimpse of her reflection, it isn't her. She's been Masked, altered into the vision of the deceased Lila Hart. Kitty has no choice but to hold up her end of the bargain if she ever wants to see Benjy again. Pretend to be Lila Hart for as long as the president permits. But why? Kitty soon releases that Lila was the face of a slowly brooding revolution, something her uncle and grandmother ended her life for. Lila's mother Celia and her fiance Knox consider themselves as leaders for change, sparking speculation that they are part of The Blackcoats. They enlist the aide of Kitty to spur the masses into revolting, something Daxton desperately needs to quash. If she betrays President Hart, she faces a future without Benjy, who will face certain death. But Celia and Knox have promised to see that Benjy remains safe, whether she joins the rebellion or not. But can they be trusted to honor their word? When Kitty is scheduled to give her first speech as Lila, she realises that the rebellion may need someone with her background to invoke change. For far too long the system has judged those of lower ranks, while high society thrives. But it seems her captors aren't who they seem to be. Can Kitty help the Black Coats while keeping her and Benjy safe? I loved Pawn, a true dystopian where society is oppressed by the ruling president and his family. At seventeen, citizens are subjected to testing, which result in being branded a roman numeral on the back of their neck, the more intelligent, the higher your ranking, but Kitty proves how flawed the system is when she ranks below the national average. Kitty is a intelligent girl, strong, sassy and always believed in the ranking system until she is dealt a III. 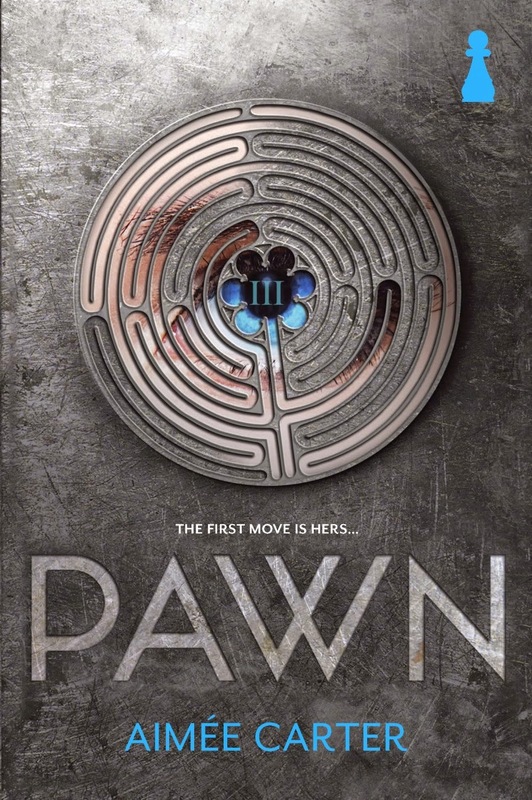 I'm a big fan of Aimee Carter and really enjoyed the Goddess Test series, but Pawn is simply brilliant, far surpassing her previous work. She's created a world in which Kitty is torn between two sides within the first family, and stripped of her own identity, forced to become Lila Hart, the presidents niece. Throughout the storyline, you can sense a secret, a betrayal or a major twist and it'll keep you on the edge of your seat. It's a gritty young adult dystopian, with a touch of science fiction, romance and suspense. I'm already itching for Captive to be released, book two in The Blackcoat Rebellion series. I loved Pawn too. I actually didn't realize that it was Carter who did The Goddess Test series - I'll definitely need to get that one now.